← Flynn’s Saudi Nuclear Deal; What do we know so far? The U.S. government is pursuing an effort to promote the sale of Westinghouse 1150 MW AP1000 nuclear reactors to Saudi Arabia. A total of 48 countries have signed such agreements but Saudi Arabia is not one of them. Saudi Arabia has for years resisted accepting a 123 agreement with these conditions. The Trump Administration is now considering accepting Saudi Arabia’s objections in order to support a Westinghouse bid for at least two and as many as 16 nuclear reactors. At $5,000/Kw, the projects would be worth about $12 billion for the first two units. The Bloomberg wire service reports that U.S. President Donald Trump considering easing nuclear rules for the Saudi project. The wire service reports that Westinghouse is looking for new markets after it emerges from bankruptcy. Past deals have barred uranium enrichment for international projects which is an issue which has prevented Saudi Arabia from signing a 1-2-3 Agreement with the U.S. Without it U.S. nuclear firms cannot do business with that country. The change that is on the table is that the Trump administration wants Saudi Arabia to consider bids by Westinghouse Electric Co. and other U.S. companies such as Curtis Wright, which makes reactor pumps, to build nuclear reactors in that country. To get to that point it may make a policy change and allow enrichment of uranium as part of that deal. The action by the Trump Administration follows an unsuccessful effort by Michael Flynn, the former National Security Adviser, working with several consulting firms, to sell nuclear reactors to Saudi Arabia and Jordan in return for lifting U.S. sanctions on Russia. Paradoxically, while Flynn claimed he was promoting U.S. reactor firms, had he been successful, Russian and/or Chinese firms would have won the business. Flynn has since pleaded guilty to lying to the FBI about his conversations with the Russian ambassador to the U.S. about lifting the sanctions. At the Nuclear Policy Education Center executive director Henry Sokolski and nonproliferation expert Victor Gilinsky published an essay in November critical of efforts by DOE Energy Secretary Rick Perry to promote Westinghouse reactors for export to the Middle East. Perry, told Congress in October 12 testimony, that “we have to support this industry,” because, among other things, it is important to the success of our nonproliferation policy. Sokolski and Gilinski argue that Perry’s position actually would, if implemented, do the opposite. For its part Westinghouse told Bloomberg “Westinghouse is pleased that Saudi Arabia has decided to pursue nuclear energy,” Sarah Cassella, a spokeswoman, said. Is Saudi Arabia ready to buy nuclear reactors from Westinghouse? There are a a few reasons why the Saudi Arabian government isn’t 100% ready to to want to do business with Westinghouse even if the U.S. loosens the requirements of the Atomic Energy Act. What the firm has in terms of a reputation is that it ran the V C Summer project into South Carolina into the ditch with bad project managers and is bankrupt for it. That project is now cancelled by the utilities that got started with it with little prospect that another firm will want complete it. The surprise about the failure at V C Summer is that there are no surprises. All of the faults that caused the project in South Carolina to come to an early halt are with failures to follow project management schedule and cost control standard practices that have been known since Admiral Rickover supervised the construction of the first nuclear submarines in the 1950s. This is not a sterling recommendation. Note that the UAE decided not to accept a bid from Areva for four nuclear reactors after learning of costly schedule delays at a project in Finland. The Saudi energy ministry would undoubtedly do similar reviews of the track record of any bidder for its program. In September 2017 the Saudi energy ministry released an RFP that cites the power rating (1400 MW of the nuclear reactors being built by South Korea in the UAE. It follows that the Saudi government, if they do anything, will be to try to get the South Korean units. Most importantly, the Saudi procurement team can kick the tires of the UAE units, so to speak, prior to signing on the bottom line. The first of four UAE units comes online in 2018 and South Korea has a similar reactor in revenue service at home which is where the UAE plant operators are learning how to run it. Another reason is that the experienced skilled trades that are building the four units in the UAE would be available. This experience is invaluable and could shave costs of construction since the workers would have already built these types of units. The UAE units will be operating in revenue service and available to train the Saudi plant operators in Arabic. The UAE model of eventually returning the spent nuclear fuel to its suppliers (Areva and Tenex) is an obvious model for any commercial deal with Saudi Arabia. It would be the one reason Congress might accept a Westinghouse deal, but it would thwart the Saudi desire for enrichment and reprocessing capabilities. South Korea’s 123 agreement, updated in 2016, with the U.S. still prohibits reprocessing of spent nuclear fuel so it would not be able to take back fuel from Saudi Arabia for this purpose. The agreement between South Korea and the U.S. opens the door for enrichment of uranium by South Korea, but only after further consultations. In diplomatic speak, that means the door is open without a specific timetable. In signing the updated agreement South Korea’s Ministry of Foreign Affairs emphasized the fact that it is exporting nuclear reactors to the UAE and hopes to do the same to other countries, including the USA. South Korea has recently entered into negotiations to supply its reactors to the UK’s NuGen Moorside project following its abandonment for financial reasons by Toshiba, the parent firm of Westinghouse. It occurs to me, and other observers, that Westinghouse has asked the White House for help to promote the Saudi deal in an effort to get the price up for sale of the troubled and bankrupt business unit to a buyer. By touting the potential for a Saudi deal, a buyer might be more interested. Hopefully, any buyer will have good help with their due diligence. Lisa Gordon-Hagerty, president of national security consulting firms Tier Tech International and LEG Inc., will be nominated by President Donald Trump to serve as undersecretary for nuclear security at the Energy Department. Gordon-Hagerty previously worked at DOE as director of the department’s emergency response office and acting director of its nuclear weapons surety office. She also served on the House Energy and Commerce Committee and spent more than five years as director for combating terrorism at the National Security Council, where she helped coordinate U.S. governmental efforts to prevent, deter and respond to chemical, biological, radiological, nuclear and conventional threats. Her professional career also includes time as executive vice president and chief operating officer of enriched uranium fuel supplier USEC Inc. (now Centrus) and a health physicist at DOE’s Lawrence Livermore National Laboratory. The Under Secretary for Nuclear Security, in the United States Department of Energy, is the Administrator for the National Nuclear Security Administration (NNSA). At DOE nonproliferation of nuclear weapons is one of its key missions. The National Nuclear Security Administration’s responsibilities include designing, producing, and maintaining safe, secure and reliable nuclear weapons for the U.S. military, providing safe, militarily effective naval nuclear propulsion plants, and promoting international nuclear safety and nonproliferation. 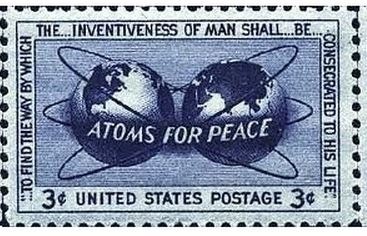 Section 123 of the U.S. Atomic Energy Act requires the conclusion of a peaceful nuclear cooperation agreement for significant transfers of nuclear material, equipment, or components from the United States to another nation. Moreover, such agreements, commonly referred to as “123 Agreements,” facilitate cooperation in other areas, such as technical exchanges, scientific research, and safeguards discussions. In conjunction with other nonproliferation tools, particularly the Treaty on the Non-Proliferation of Nuclear Weapons (NPT) ,123 Agreements help to advance U.S. nonproliferation principles. They establish the legal framework for significant nuclear cooperation with other countries. In order for a country to enter into a 123 Agreement with the United States, that country must commit to U.S.-mandated nuclear nonproliferation norms. The U.S. State Department is responsible for negotiating 123 Agreements, with the technical assistance and concurrence of DOE/NNSA and consultation with the U.S. Nuclear Regulatory Commission. As of January 20, 2017, the United States has entered into 23 such agreements that govern peaceful nuclear cooperation with 48 countries, the International Atomic Energy Agency and the governing authorities on Taiwan.